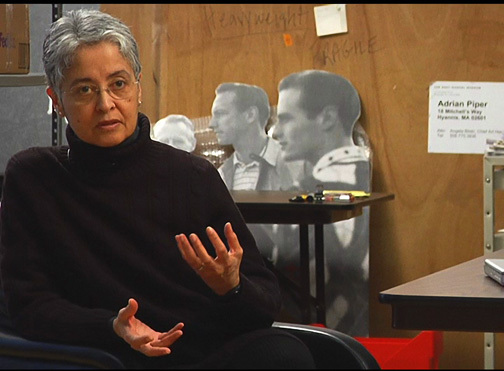 Adrian Piper’s practice as a first-generation Conceptual artist in the 1960s led her to Kant’s Critique of Pure Reason; and this, in turn, to an in-depth study of philosophy that culminated in a Ph.D. in philosophy from Harvard and a successful academic career as a professor of philosophy. Though Piper has referred to this as her “day job,” she has also often said that her philosophical work is the theory that her artwork puts into practice. That theory is now available in its entirety in her Rationality and the Structure of the Self. 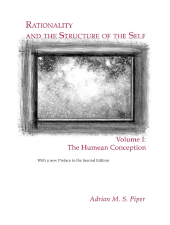 Volume I: The Humean Conception critiques the prevailing desire-centered conception of the self, and Volume II: A Kantian Conception develops an original Kantian alternative. Encompassing the history of moral and political philosophy as well as engaging head-on with contemporary debates in ethics, economics and philosophical psychology, Piper’s two-volume project has been praised by philosophers as “groundbreaking,” “very powerful,” “original and important,” “brilliant,” “indispensable,” "a blockbuster" and “a highly significant contribution.” Art professionals will find it equally useful for understanding Piper’s unique contribution to Conceptual art and to art theory more generally. Thirty-four years in the making, Rationality and the Structure of the Self was finally accepted for publication by Cambridge University Press after more than thirty referees had refused to read it. The first edition of both volumes appeared here as two open-access e-books in May 2008. Robert Del Principe asks candid questions, both pertinent and impertinent, about their history, content and implications. 60 Minutes. With German subtitles. The Humean conception of the self consists in the belief-desire model of motivation and the utility-maximizing model of rationality. This conception has dominated Western thought in philosophy and the social sciences ever since Hobbes’ initial formulation in Leviathan and Hume’s elaboration in the Treatise of Human Nature. Bentham, Freud, Ramsey, Skinner, Allais, von Neumann and Morgenstern and others have added further refinements that have brought it to a high degree of formal sophistication. Late twentieth century moral philosophers such as Rawls, Brandt, Frankfurt, Nagel and Williams have taken it for granted, and have made use of it to supply metaethical foundations for a wide variety of normative moral theories. But the Humean con­ception of the self also leads to seemingly insoluble problems about moral motivation, rational final ends, and moral justification. Can it be made to work? Adrian Piper argues that the Humean conception can be made to work only if it is placed in the context of a wider and genuinely universal conception of the self, whose origins are to be found in Kant’s Critique of Pure Reason. This conception comprises the basic canons of classical logic, which provide both a model of motivation and a model of rationality. These supply necessary conditions both for the coherence and integrity of the self and also for unified agency. 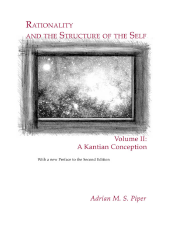 The Kantian conception solves certain intractable problems in decision theory by integrating it into classical predicate logic, and provides answers to longstanding controversies in metaethics concerning moral motivation, rational final ends, and moral justification that the Humean conception engenders. In addition, it sheds light on certain kinds of moral behavior – for example, the whistleblower – that the Humean conception is at a loss to explain.